Frontline is often recommended by veterinarians for its effectiveness against flea and tick infestations in dogs. However, more and more people are starting to ask the question: “Is this product doing more damage to my dog – and potentially to me and my family – than the pests it is supposed to protect her from?” In this article, we are going to take a look at some of the reported side effects of the primary chemical used in Frontline products and recommend some natural, safer alternatives to Frontline. The main active ingredient in Frontline is a chemical called fipronil. Fipronil was developed in the mid-80s as an insecticide and began to be sold as such in 1993. According to the National Pesticide Information Center, today, fipronil is used in a wide range of products, from pesticides to liquid termite control products, to products for agriculture, as well as, of course, spot-on pet care products. Frontline is applied by placing a spot of the liquid through a pipette between a dog’s shoulder blades. It is absorbed by your dog’s oil glands and begins to work immediately. It continues to self-distribute for a month to your dog’s hair and skin, attacking ticks, fleas, flea eggs, and larvae. For some dogs, the side effects of Frontline are more damaging than a flea or tick infestation itself. While the only potential side effect listed by Frontline is skin reactions, dog owners and researchers have noticed other reactions as well. Skin irritation is probably the most common side effect of Frontline. This product has been known to cause itching to the point where a dog scratches so much that sores and ulcers form. It can also cause erythema (redness) due to irritation. Alopecia, or hair loss, and hair changes, have also been noted at the application site. Although proper application should prevent your dog from being able to reach the application site with her mouth, dogs that have ingested Frontline products can experience damage to the nervous system. Symptoms can include vomiting and diarrhea, weakness, dizziness, and even seizures. Fipronil has also been found to accumulate in organs like the liver and kidney, leading to organ damage and failure. All of these side effects can also occur in humans, either through ingestion, inhalation, or contact with skin. 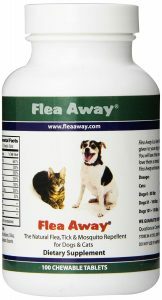 *As with all flea and tick control products, they should only be used on dogs 12 weeks or older. After shampooing or swimming, you will probably need to reapply these spray-on products. 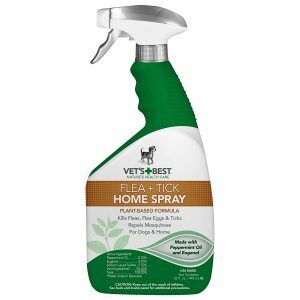 This product from Vet’s Best seems to be a popular all-natural flea control spray for use on dogs and for the home. The key ingredients are peppermint oil and clove extract control, which kill both fleas and ticks and also repel mosquitoes. Vet’s Best guarantee there are absolutely no chemicals in their solution – just natural extracts and ingredients which kill and repel pests. This product won’t stain, so you can also spray this around your home without worrying about damage to your carpet or furniture. 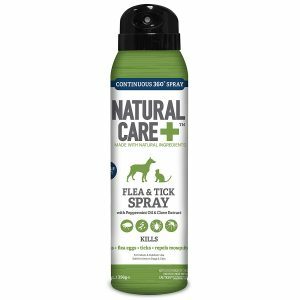 Customers rate this flea and tick spray as an effective and affordable natural flea and tick control product. However, there are some complaints that it does not kill ticks and fleas on contact. Playing on the word “pesticide,” Wondercide suggests itself as a great alternative to pesticide-based products that does wonders. Indeed, many customers have rated this product highly for its effectiveness – both on pets as well as humans! 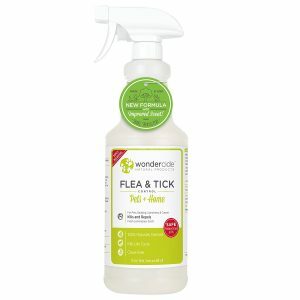 Wondercide can be used as a preventative measure as well as treatment on dogs and cats and home interiors. They claim that their product kills the full flea cycle, as well as ticks, mosquitoes, mites, mange, and more! They guarantee a chemical-free, non-staining product that is safe to use on your dog, whether she is a puppy, a nursing mother, or a senior. Wondercide even say this product will comfort dry skin and leave your dog’s coat looking beautifully shiny! Some customers seem to find the smell of lemongrass a bit overbearing. If you aren’t a fan on this scent, this product is also available in cedar or rosemary. Dr. Green Pet’s flea control is made with 100% natural ingredients. They use a blend of premium essential oils and extracts to create a natural scent that keeps pests at bay. These include: pure peppermint, clove, cinnamon, and cedar oils. All these oils are very nourishing for your dog’s skin and coat, too, so this could be a good choice for dogs with dry, itchy skin. 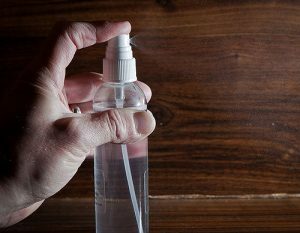 The product comes in an easy-to-use squeeze spray bottle for fast application, whether you want to use it on your dog or around your home. Most customers report that this product has an appealing scent, and many were happy with the results. However, a few reviewers said that the product either only worked for a short time or did not work at all. This product from Natural Care can be used on multiple home surfaces such as carpets, drapes, and countertops as well as pet bedding. When sprayed and massaged into skin of the dog, it should repel mosquitoes and kill fleas, flea eggs, and ticks. As the name suggests, this product is chemical-free. It contains plant extracts (peppermint oil and clove extract) which kill fleas and ticks the all-natural way. Many dog owners have rated this product highly for its effectiveness in killing fleas. Plus, they seem to like its fresh minty scent! However, as is the case with most of these products, it does not seem to work on all dogs. This flea repellent comes in the form of a supplement, which is a liver-flavored (yum!) vitamin complex specially formulated for dogs and cats. The idea is that these FDA-approved vitamin pills cause your dog to release an odor that is undetected by humans, which repels fleas, ticks, and mosquitoes. 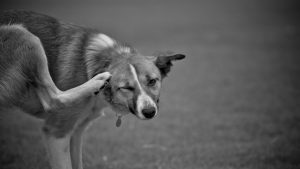 This means that fleas and ticks should not get as far as biting your dog as they do with other products (after which they find chemicals and go away or perish.) For this reason, this product may be a good choice for dogs who suffer from flea bite allergies. Another plus is that she gets a nutritious dose of vitamins at the same time! A downside with this product is that it is not immediately effective – they recommend to allow 30 days for it to kick in. Many customers claim their dog was flea- and tick-free with this product. However, some report no difference, though this could be due to the 30-day waiting period. Some reviewers also say their dog got an upset stomach from this product. Looking for alternatives to Frontline and other chemical-based spot on sprays is a good idea if you are worried about the potential harm they can cause – both to your dog and to your family. Luckily, there are plenty of natural, safe choices out there. All of the products in this review are popular choices, but do bear in mind that not all of the products seem to work for every dog. So, it may be a case of trial and error, but at least it will be a worry-free one!